more indicative of the presence of a disease. different antibodies tested for can be indicative of many different diseases. Anti-SM: Typically only present in Lupus. Anti-La: Seen mostly in Sjogrens patients, but also seen in Lupus and Scleroderma. Not commonly seen without Anti-Ro as well. Anti-Jo-1: Only seen in Polymyositis. 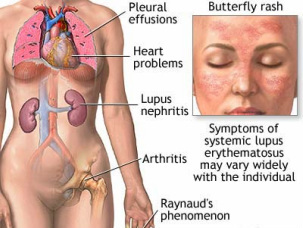 antibody can not alone determine if you have lupus. damage, including heart attacks, and liver disease. which specific form of CPK is high helps doctors determine which tissue has been damaged. and symptoms and other tests to evaluate an individual for an acute or chronic inflammatory condition. conditions, such as	anemia, infection, and many other disorders. combinations of abnormal results, can indicate a problem that needs to be addressed. the ESR is typically used in conjunction with other tests. antiphospholipid antibodies and to help diagnose antiphospholipid syndrome (APS). antibodies to detect their presence and to provide the doctor with additional information.